When presenting a storyboard, you will most likely receive comments and feedback. The Pitch Mode workspace allows you to easily draw comments and corrections over your panels. In Pitch Mode, you do not have access to the drawing layers in your panels, so when you draw corrections on your panel, a new Comments layer is automatically added for you on top of the panel. 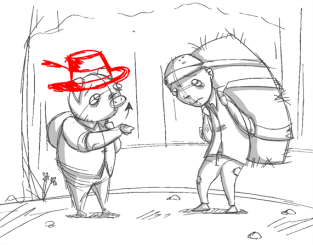 You can use this new Comments layer the same way as any other drawing layer in your scene. Adding comments and corrections in Pitch Mode is easy. As soon as you start drawing with the Brush tool, the Comments layer is added. If you no longer require a Comments layer, you can delete it while you are still in the Pitch Mode workspace. In the Pitch Mode workspace, you can use the Onion Skin feature to see your previous and next panels—see About the Onion Skin. To see the onion skinning, deselect the Camera Mode button in the Control Panel view. 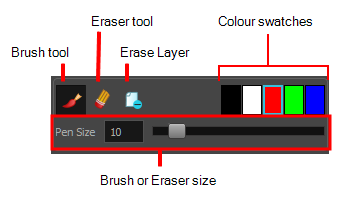 In the Comments section of the Control Panel view, select the Brush tool or press Alt+B. Click a colour swatch to select a colour for your brush. 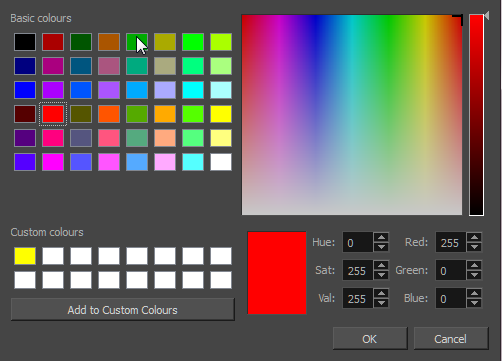 To change the colour, double-click the colour swatch to open the Select Colour dialog box. Select a new colour—see About Colour. Set the brush size and click OK. In the Stage view, add your comments and corrections. In the Camera view, draw your correction. A Comments layer is added on top of your layers. To access the Comments layer, click the Exit Pitch Mode button. The Pitch Mode workspace is closed. ‣ In the Comments section of the Control Panel, click Eraser tool or press Alt+E. ‣ In the Comments section of the Control Panel, click the Erase Layer button. The Comments layer is deleted. You cannot delete any other layers.